An article written initially for a Steiner Waldorf Parenting magazine. When we hold a newborn child in our arms, we can sense that it is a very special experience. We feel wonder and awe at this new life and at the delicate intangible quality around the child, drawing out of us powerful feelings of tenderness and protectiveness. I believe this is a response to the human spirit. At birth the child is still soft and open, like a flower, not really grounded on the earth, which allows us to experience their spirit more strongly than at other times. This article explores an approach to parenting based on such a belief in the spirit in the child, and the gradual incarnation of this spirit throughout childhood, such as Rudolf Steiner describes in his works on education. The basic notion underlying this approach to parenting is that children come to us at birth from out of the world of spirit to fulfil a certain destiny while on the earth. They come with trust, and choose parents whose task will be, ideally, to provide an environment within which the child can grow, unhurried, protected, loved and well nourished – in body, soul and spirit. A deeper understanding of the developmental needs of children can help in providing an environment which nourishes the unfolding of all the child’s capacities. Early this century Rudolf Steiner described the complex developmental stages of childhood. These have since been observed and worked with by Waldorf educators for over eighty years. In addition we have the studies of mainstream child psychology to add to the picture of the child as a gradually maturing being. We know that the child’s means of perceiving and understanding the world changes significantly in childhood. Steiner described how children only gradually take hold of their physical bodies, their ‘earthly houses’, to make them into suitable homes for their own individualities. He described the wonderful way in which the child’s capacities rhythmically unfold during childhood in three seven year stages, commonly marked by the established change of the baby teeth and puberty. If we examine these stages of childhood more closely, we can see the role of the parents emerging from the needs of the children. First, all through childhood, children need to feel love and respect for their innermost being, to trust that their essential dignity will not be violated. For parents and caregivers this means that, almost from conception, children need to be treated not only with love, but with the respect with which we would normally treat any of our equals. To treat each child with consistent, genuine politeness is one of the simplest ways to ensure the child feels this respect. From conception on, the human spirit-becoming-child needs emotional and physical warmth, protection, predictability, good nourishment and a healthy rhythm and form within family life. All of these things are becoming increasingly difficult to provide in the somewhat chaotic, stressful lives we often lead. They must be sought with increased determination and commitment, as a balance to the unhealthy aspects of what the contemporary world surrounds us with. In the first seven or so years, children are very open and vulnerable. They absorb impressions of the world into the deepest parts of themselves, unable to keep them out. They therefore have a great need to be protected from experiences which violate the tender growth of all their senses and being. As adults we have learnt to cut ourselves off from unpleasant sensory bombardment. Yet even we are being stressed by the assault of the modern world, with mechanical and electronic noise and pollution, lack of rhythm and isolation from nature. Steiner describes how these things affect the healthy development of children, possibly even at the deepest levels of organ growth. Where possible, our children need to be protected from such an assault, and given instead quality aesthetic and natural experiences. These are more subtle in their colour, texture, sound, touch and soothing movement, and can nourish and educate their senses in a more refined way. They also need silences, and uninterrupted quiet times in which to dream in and meet themselves. Children need to feel a relationship with the rhythms of nature and time, for example, through meaningful family celebrations of the seasons or traditional festivals like Christmas and Easter. Children have a very different consciousness from that of the adult. At first they feel very much part of the world and at one with it. Only slowly do children ‘wake up’ and feel separate, first from their mothers and care givers, and gradually from the world. Initially this awareness of being separate happens on a physical level, when the children feel a sense of a separate self and consolidate their use of the word “I” – often at about two and a half years. Later in childhood children will experience their separateness on more subtle soul and spiritual levels. These times can be scary for children who, more than ever, need warm human contact), joyful interactions, smiles, cuddles, and affirmations for just being who they are. In the first seven years, children learn by imitating what is around them. Their thinking is still very ‘concrete’ so they learn more by imitating and doing than by verbal instruction. They need to see their family working and to share in that work – cooking, cleaning, gardening, building. They need models of initiative, action and courage, of love, joy, honesty, self confidence, serenity – of all the qualities you wish them to have. They need clear messages of approval, of themselves and what they do, when they do it right. They need gentle honest feedback, when appropriate, on how to do it better when they do not do it right. They need adults to teach them about the appropriate use of their own power, what is legitimate and to be celebrated and what is illegitimate, tyrannical and unacceptable. Children learn to live in the world, to develop their thinking and imaginative power through their play. Parents can provide an environment which encourages healthy play, and provide simple open ended playthings which leave room for the imagination and ingenuity – inexpensive playthings, cloth, boxes, old clothes, shells, pine cones, pebbles, pegs and string, wood, water and sand etc. Of course children also need dolls – simple, friendly, loveable flexible dolls, with which to practice how to interact with and to nurture people (and to scold them sometimes!). 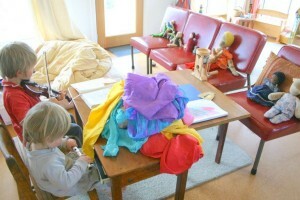 It is especially important for boys to have dolls to encourage the development of the nurturing side of their natures. Doll play can be very healing. Toys which ‘do everything’ and screen time compromise a child’s play, as these interfere with the child’s natural ability to play in a spontaneous and creative way, as well as depriving the child of human interaction and broad sensory experience. It is helpful to teach children early that these ‘entertainments’, so dominant in the world today, need to be balanced by healthy creative activities. Children need to be told suitable stories which reflect the world they move in – at first the world of everyday things, then gradually adding to this the world of imagination, like the world of the great archetypes to be found in traditional folk stories. Apart from the value of the content of the stories and the special time shared, listening to stories being told and read, provides a solid basis for learning to read. Attention to all these things in the first seven years can form a strong foundation for the healthy growth of body, soul and spirit in the child for the rest of childhood. In the middle part of childhood, after the change of teeth has occurred, we see the potential for the wonderful further flowering of the imagination. It is a time when children learn by thinking in ‘pictures’, not abstractions. More than ever they need stories which are rich in images and metaphors about the world and the nobler aspects of human struggles. Folktales, fables, mythologies and stories of creation, and stories of the great heroes, heroines and leaders. These are all rich in images that meet the children’s changing awareness of themselves and the world, their awareness of good and bad, of society’s rules, and of human struggles and achievements. After seven, the children live more and more in their own inner world, separating from the outside world and their parents a little more, with a new need for privacy. The crisis of feeling a ‘soul separateness’ at nine can be a frightening, lonely time, even as they feel more in control of time and can plan and organise themselves better than ever. Questions about their birth or adoption may arise. In these years children are wanting ‘authority’ in the sense that they need people who can be true ‘authors’ of the information and experiences they share with the children at school and at home. Children need the emotional safety of clear guidelines and boundaries within which to work (even though they may challenge these boundaries at times). Gradually they begin to see life as it really is, including our fallibility! As parents and educators we need to be sensitive to when they are emotionally mature enough to be exposed to the ‘hard facts’ about the world. Unnecessary early exposure, as happens with adult media, can bring a ‘hardening’ with emotional callousness and toughness in children, as they try to protect themselves against this threatening world. This can bring with it an emotional vulnerability later. Children in these years of middle childhood still need to feel adult protection. They also need to see that we can listen to them, have a sense of humour, take them seriously and admit when we are wrong. The children’s awakening to our human faults and foibles can be frightening for them if they do not also see our more noble qualities of courage, positivity, determination in the face of difficulties, humility, loving compassion and so on. They need us to be worthy of being their ‘authority’. Then they can also accept our human weakness. More recent world events have shattered our illusions about our safety in the relative ‘safe havens’ of places like New Zealand and Australia, therefore it is particularly important as parents and teachers, to work at strengthening our ability to show serenity, wisdom and compassion in times of crisis when our children are with us. Adolescence is a time for them to search for their highest selves, that part of them you have cherished during their childhood. It is also a time of great bravado, and incredible self consciousness and vulnerability. The adolescents’ need to be alone while at home or to be out in the world with their friends, can seem to shatter all family togetherness. Yet it is a time when they need even greater parental understanding. They need their affirmations now more than ever. They need to be given your trust even when they are not yet trustworthy, so that they can learn to be trustworthy. They also need to be part of negotiations on boundaries, responsibilities, and the consequences of those responsibilities not being met. They need to know that some behaviours are unacceptable and that parents have rights too. They need help to understand that rejection of some of their tastes and choices is not the rejection of their essential selves. Gradually, they become more mature, ready to take hold of and work with the destinies which brought them to earth as babies. In terms of spiritual growth, they are still just beginning their journey. Ideally through late adolescence, parents gradually let go of their children, as children… to recreate a loving friendship again on new terms, young adult to older adult. Such is the role of the parent, who cares for the well-being of the whole child, body, soul and spirit.